I found a box of old letters in my attic. It was full to the brim of all sorts of messages from school friends, work colleagues, letters from family letting me know they’re still alive! Notes of thanks, beautiful love-letters from Berlin, postcards from Amsterdam, Basil, Hawaii, even a telegram from New York wishing me well in my college exams, this was the Golden Age, long before the dawn of emails or mobile phones and I’ll tell you some of them had me in tears. My goodness what a treasure trove and you know when it comes to memorabilia I am quite the hoarder so finding the bundles of memories wasn’t too surprising but what did catch me off-guard though was the over-whelming sense of nostalgia, how emotional I found re-reading about myself, my past, the people I knew, places I’d been and how in letters everything is so much more intense, more profound than talking face to face or on the telephone. You can really get to the heart of somebody through their letters, in fact I think it was the columnist Phyllis Theroux who said writing letters is a way of going somewhere without moving anything but your heart. And it just got me wondering about how the great poets, writers and thinkers of our time tackle the art of letter writing, what letters mean to them, how in their written world, relationships can evolve and deepen through correspondence. So I’ve chosen a couple of poems on the theme, poems that moved me or spoke to me in some way and I’d like to juxtapose these with actual love letters, maybe not mine but the most heartfelt words written by some very famous people including Beethoven, Albert Einstein and Mexican artist Frida Kahlo. We’ll have music too from Robert Plant and Alison Krauss, Nick Cave and more…. So it’s not nosey to steal a look what the Austrian composer Wolfgang Amadeus Mozart had to say, we’re just curious okay! When he was a little known musician he fell in love with a girl named Aloysia Weber, a successful singer from a musical family. She didn’t feel the same however but in 1782 when Aloysia’s father died the Weber’s rented rooms in their house to cover the bills, Mozart, now a promising musician moved in, and soon fell in love with Constanze — the third Weber daughter. In August of that year the two were married and remained together, very much in love, until Mozart’s death nine years later. Sometimes it’s difficult to hold yourself back when you’re in love and I suppose when you’re writing a love letter you imagine it will only ever be read by it’s recipient, but happily for us some of the greatest minds were prudent with their correspondence. 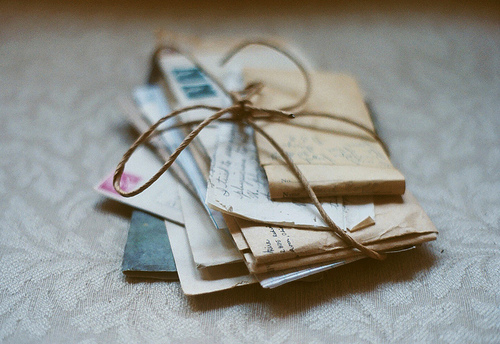 I wonder if people would be interested in my love letters a hundred years from now? I wonder if the people I sent them to kept them like me or tore them up and threw them away? Who knows J Someone who held onto his was German born Physicist Albert Einstein. His correspondence with his fellow student and future wife Mileva Maric began in 1897. His family totally disapproved, not least because Einstein was only 21 and they felt that settling down so young would compromise his career prospects. She was his intellectual equal however and based on these letters, he felt that in Mileva he had found his soul mate. When I think of Einstein I think of the philosophy of science, physics, that most famous equation but thinking about him in terms of relationships and love makes him so much more normal. When I’m not with you I feel as if I’m not whole. When I sit, I want to walk; when I walk, I’m looking forward to going home; when I’m amusing myself, I want to study; when I study, I can’t sit still and concentrate; and when I go to sleep, I’m not satisfied with how I spent the day. No matter what happens, we’ll have the most wonderful life in the world. Pleasant work and being together. Even when I am in bed my thoughts rush to you, my immortal beloved, now and then joyfully, then again sadly, waiting to know whether Fate will hear our prayer — To face life I must live altogether with you or never see you… Oh God, why must one be separated from her who is so dear. Be calm; for only by calmly considering our lives can we achieve our purpose to live together — be calm — love me — Today — yesterday — what tearful longing for you — for you — you — my life — my all — all good wishes to you — Oh, do continue to love me — never misjudge your lover’s most faithful heart. Imagine receiving a letter like that? Words can be irresistible can’t they? I have loved in her the image of the beauty of the world, the mystery and beauty of life itself, the beauty and doom of the race of whom I am a child, the images of spiritual purity and pity which I believed in as a boy. So there you have it, Letters – of love, of tragedy, of truth, they may change our lives, some may take us our whole lives to write but there’s a magic and intensity to the written word, an enchantment from one warm hand across an ocean to another that cannot be replicated by texts or emails or phone-calls. So go write …. write for your life! Also on the show today, Frida Kahlo, Diane Wakoski, Yusef Komunyaaka, Diane Thiel.